In his position as Vice President and Assistant General Manager of the Winnipeg Jets, Larry Simmons assists Executive Vice President and General Manager Kevin Cheveldayoff in all facets of the daily management of the hockey operations department, including player personnel decisions, management of staff, player contracts and salary cap management, scouting, and statistical and competitive analysis. 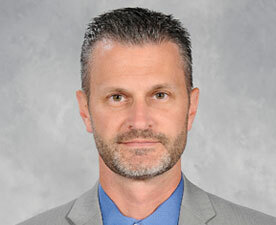 Retained with the acquisition of the franchise, Simmons held the position of Vice President and Assistant General Manager with the Atlanta Thrashers from 2004 through the team’s relocation to Winnipeg in 2011. Simmons, who originally joined the expansion franchise in Atlanta before play began in 1999, held various roles within the hockey operations department prior to 2004, including player contract research and negotiations, player transactions and personnel management, salary arbitrations, strategic planning, budgeting, scheduling, and the administration of the Collective Bargaining Agreement. Simmons also served as the direct liaison between the Thrashers and the organization’s top development partners, and was instrumental in developing and managing the minor league affiliations with the 2002 and 2008 AHL Calder Cup championship-winning Chicago Wolves and the 2001 IHL Turner Cup champion Orlando Solar Bears. Prior to joining the Thrashers organization, Simmons spent six years working for RDV Sports in Orlando, the parent company of the NBA’s Orlando Magic and the Orlando Solar Bears, where he served as a key member of the start-up efforts of the Solar Bears IHL expansion franchise. Simmons holds both a bachelor of science degree and a master of business administration degree. He and his wife, Cheryl, have a daughter, Maci, and a son, Rylan.